Sunny Day Supply, owned by Mary S. Dugan & Shawn Morris, is a new favorite online shop of mine. I'm just going to share a few thoughts about my experiences with these lovely ladies. Amongst some pretty great fabric finds, they stock Liberty of London. 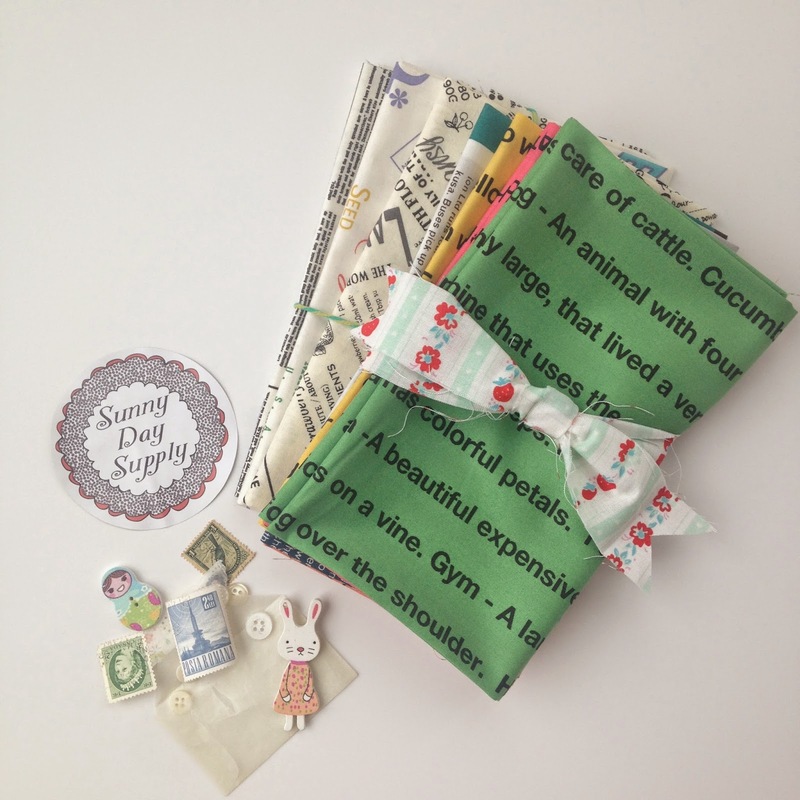 Today on my Instagram account @kamiemurdock you can enter to win these Liberty Tana Lawn fat eighth bundles. I am relatively new to Liberty, but am fast becoming a fan! Giveaway closes at 10:00 a.m. EST 03-30-15. 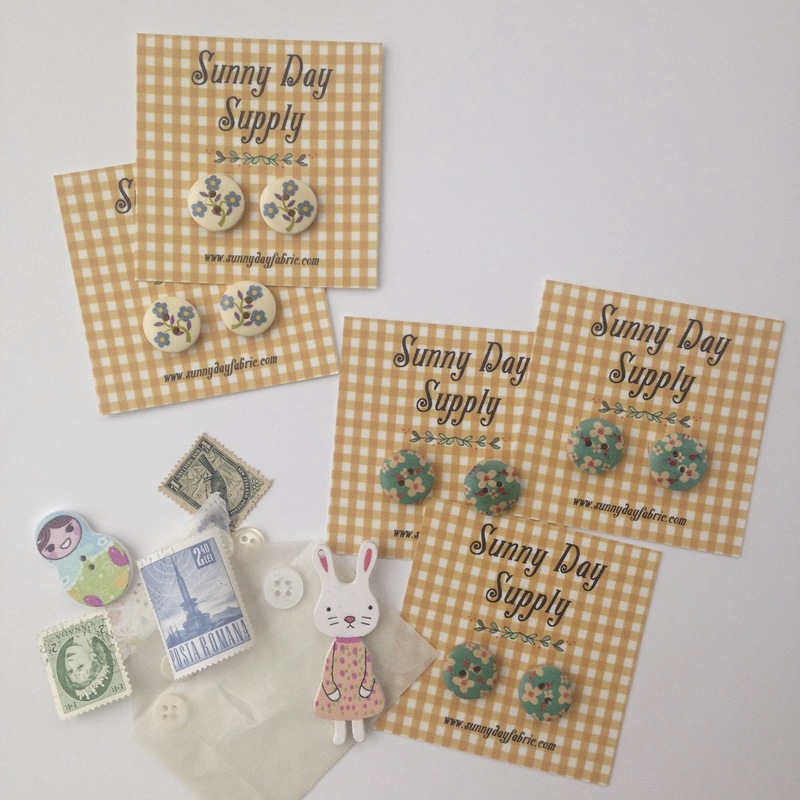 I love their whimsical button selection, (these are just a couple) and plan to use these on clothing for my little daughter. Perfect! 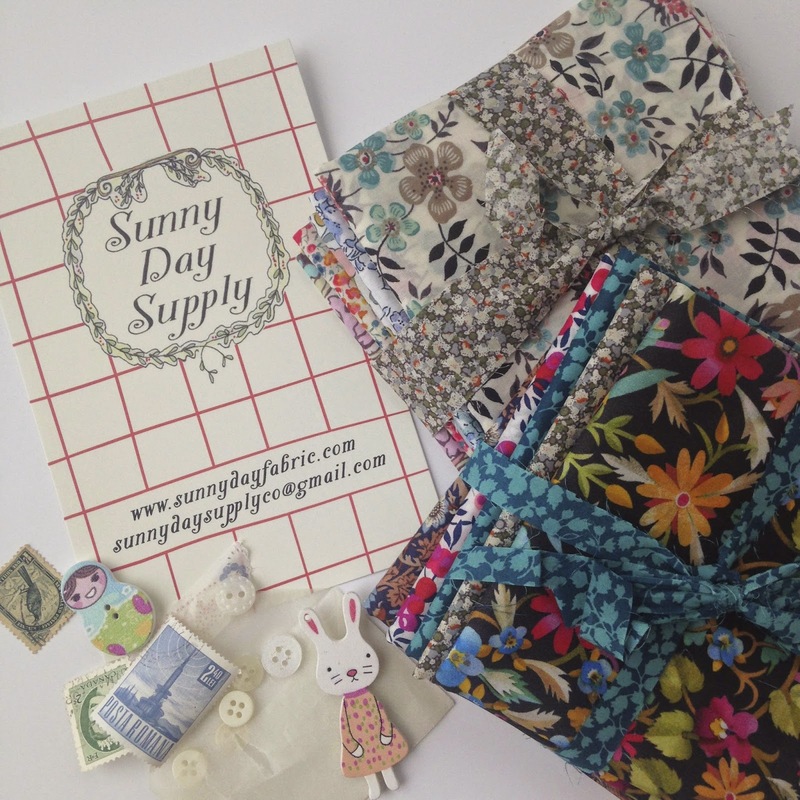 They also have zippers, pulls, yardage, embroidery threads, etc. So many other fantastic finds, for sure! I have found ways to inject fabric from their curated bundles into several of my projects so far, and love the look they give to them. 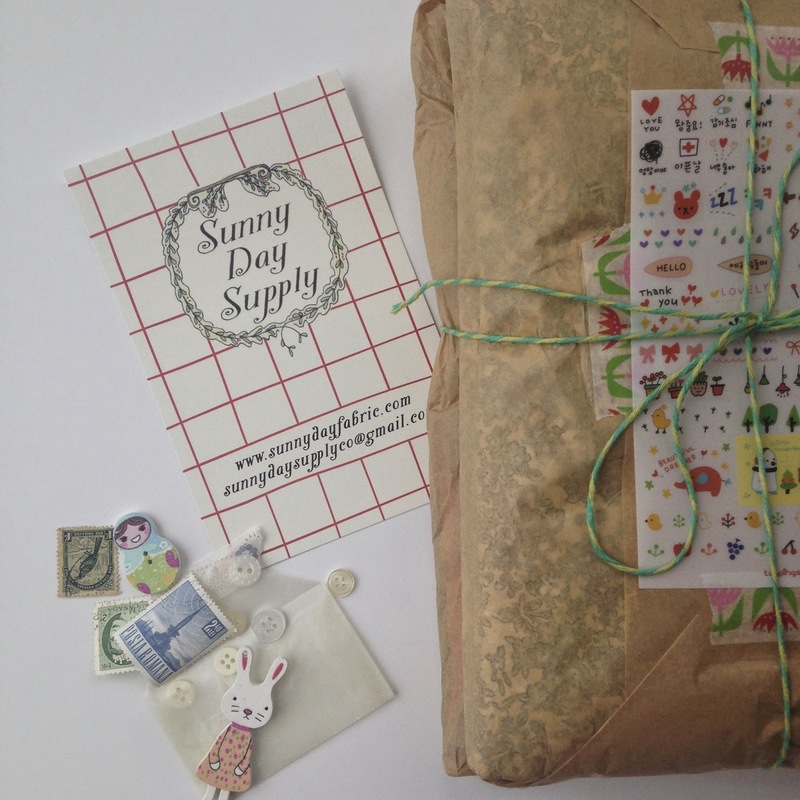 I'm so happy to have found their bright little shop! to win! Giveaway ends 10:00 a.m. EST 03-30-15. 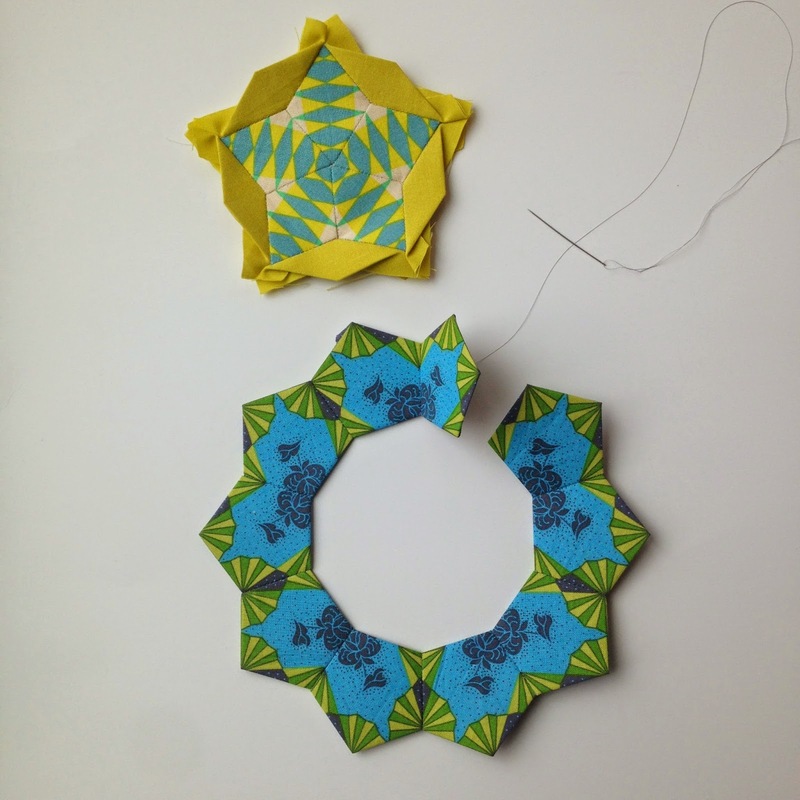 Here is the process I use to assemble a laPassacaglia rosette. Every little shape has its own important role in this masterpiece. Truly a "sum of the parts"- type project! 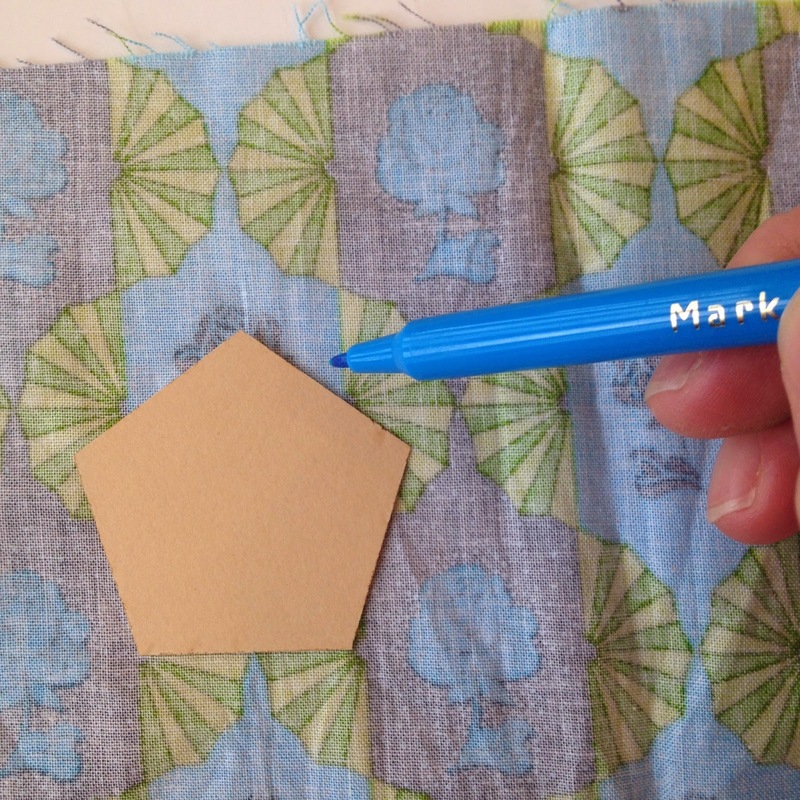 I use a water-soluble pen to trace my paper shape onto my fabric. 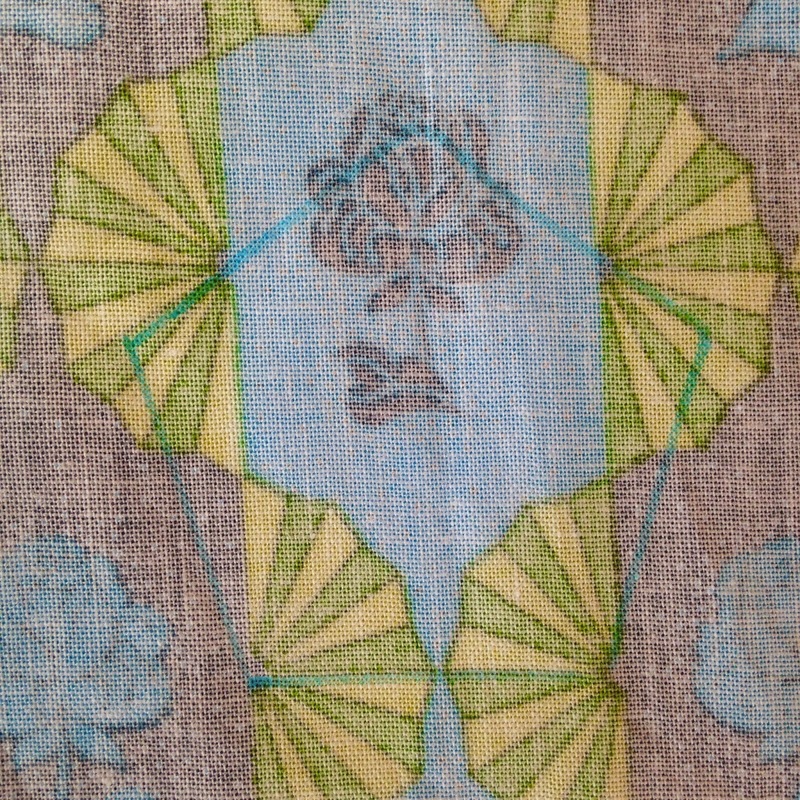 I then find the repeat in the fabric design, and trace the next 9 exactly the same. Using about a 3/8" seam allowance, I hand cut around my traced shapes. I'm old-school about this part. Some choose to rotary cut these; I don't trust myself to keep from cutting into the next shape! Fussy-cutting is definitely wasteful. For this reason, I pick and choose certain elements in each cog to use this technique. I do enjoy the designs I'm able to produce! 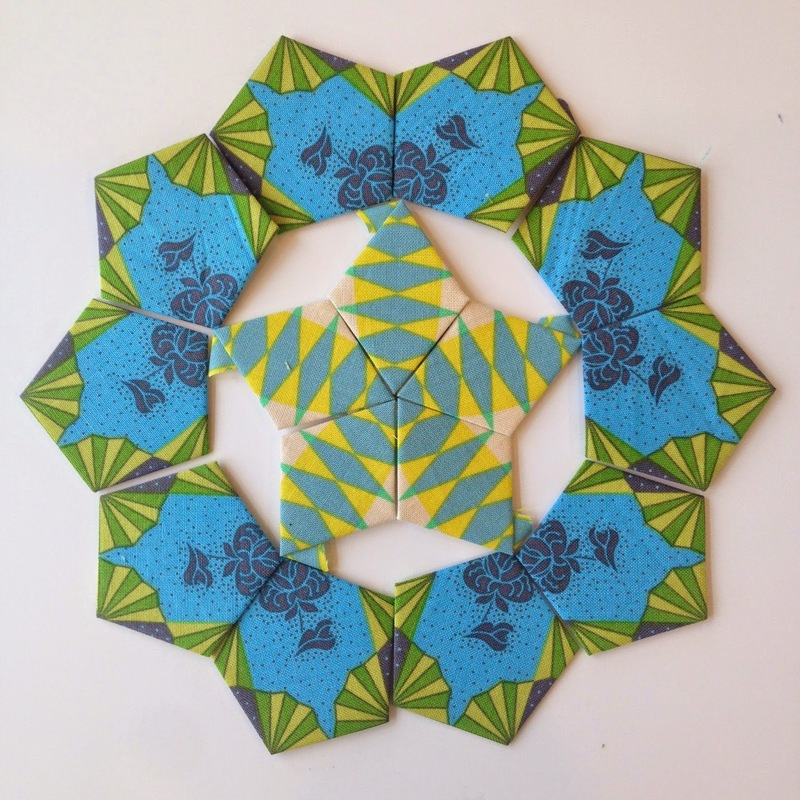 I glue-baste my paper shapes. 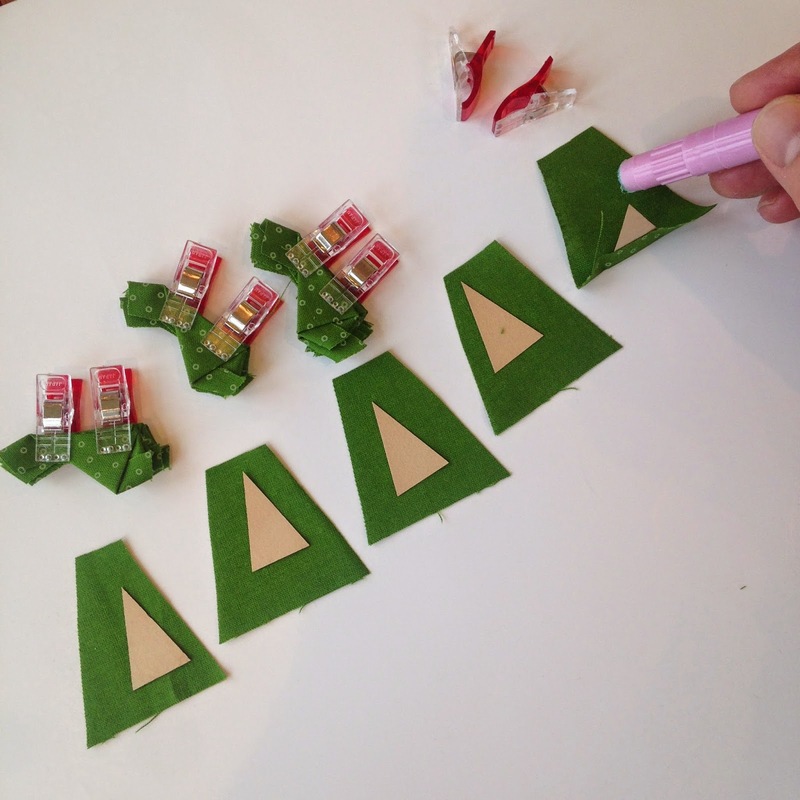 I use a water-soluble glue pen with a thin cartridge to keep from gluing too much of my paper shape. 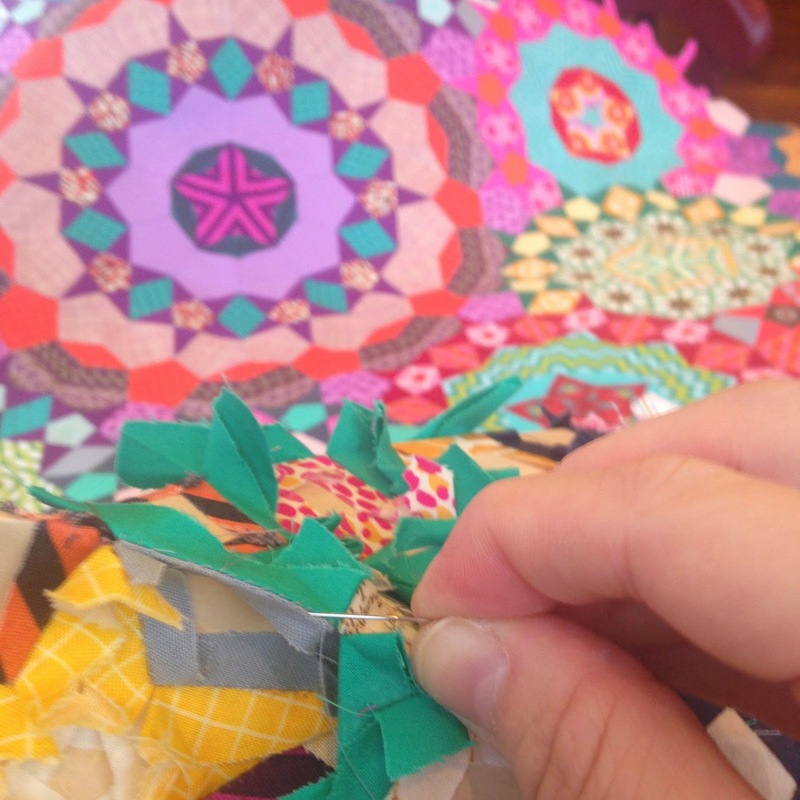 I then fold and clip the prepared shape. I love using Wonder Clips! 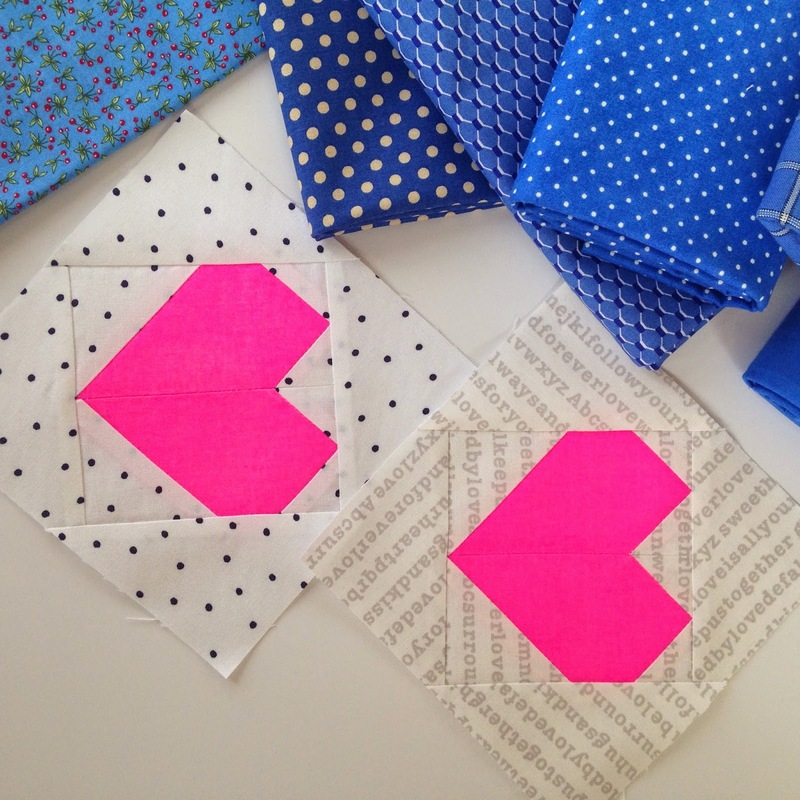 One thing I try to do when sewing a fussy-cut piece is look to see that the fabric design matches up when right-sides are together (RST). Everything to the right of my needle (see above) looks good here. I then add the yellow diamonds around the center star. 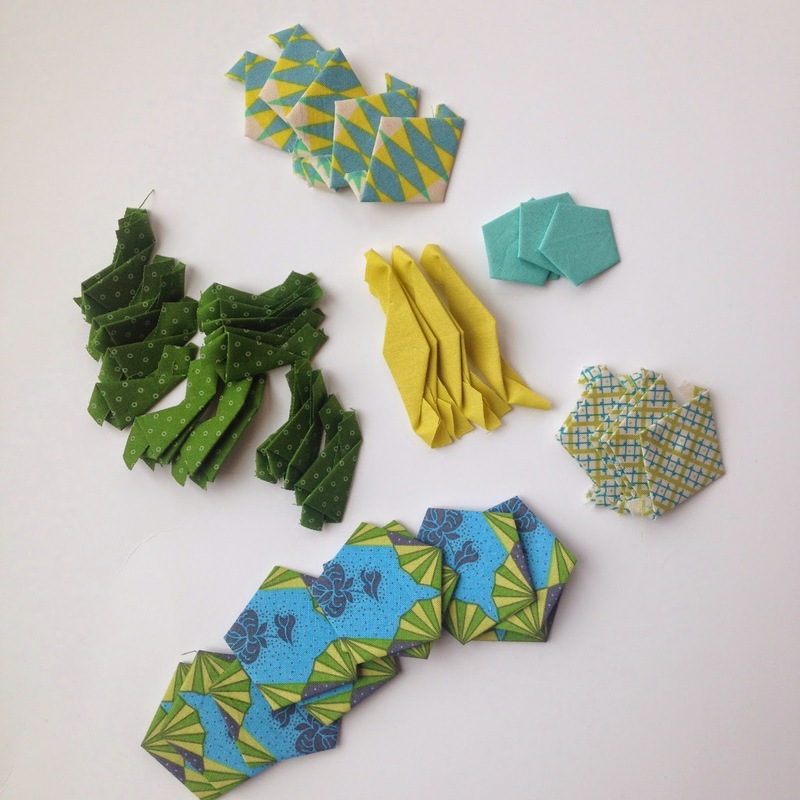 Now the blue fussy-cut pieces are ready to be joined, but I have a few layouts to choose from. 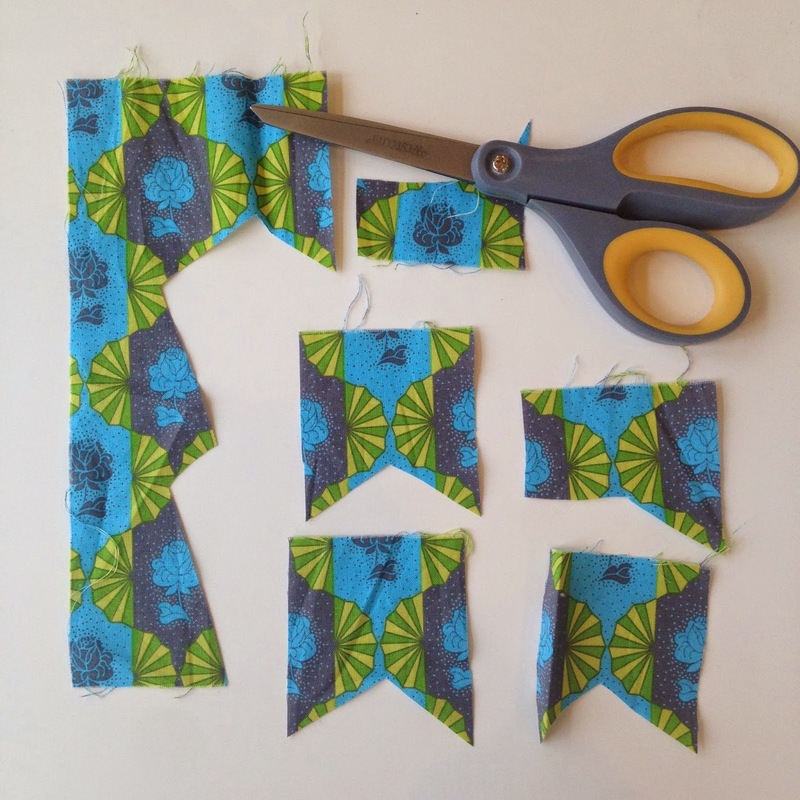 That's another part I love about fussy-cutting fabrics! 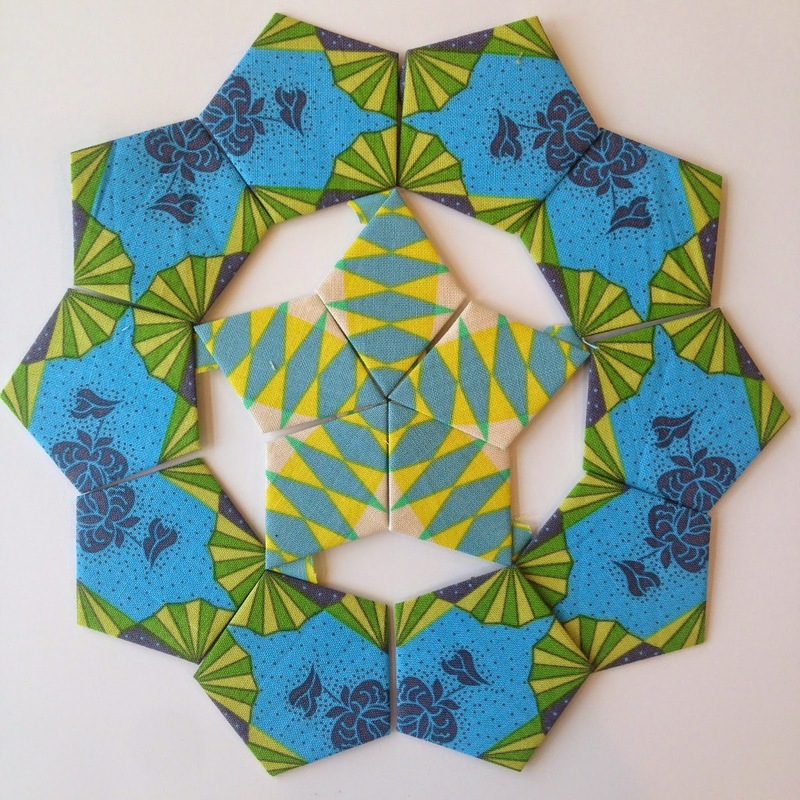 There are several ways I can arrange the exact same pieces to make a different look. These stars. They are so tedious and tiny! Love them, or hate them? Either way, they truly give this quilt its unique look. 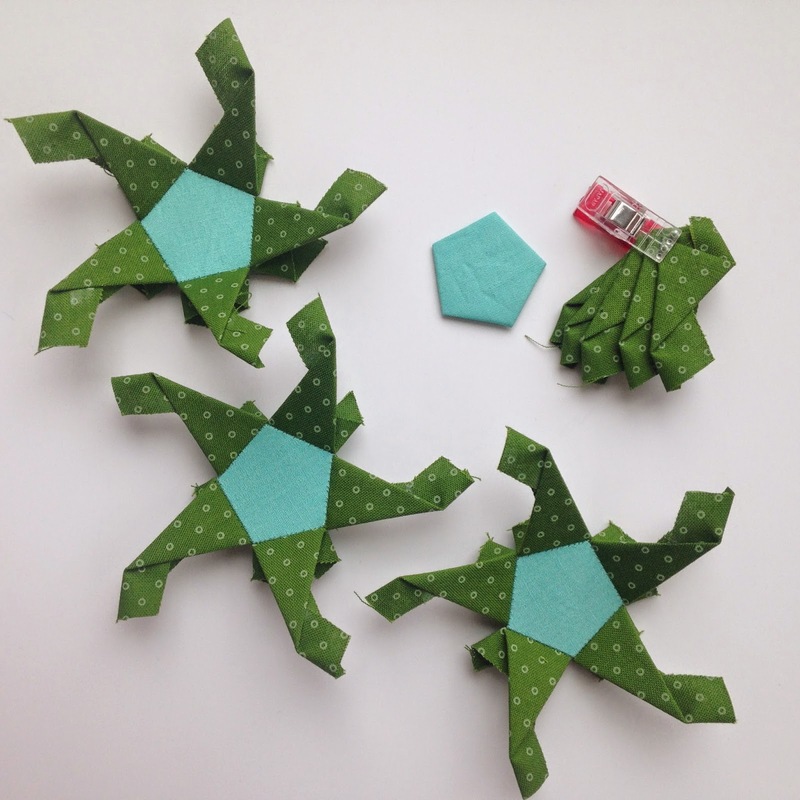 I assemble mine one unit at a time, and then sew the connector diamonds in between to make a partial wreath. 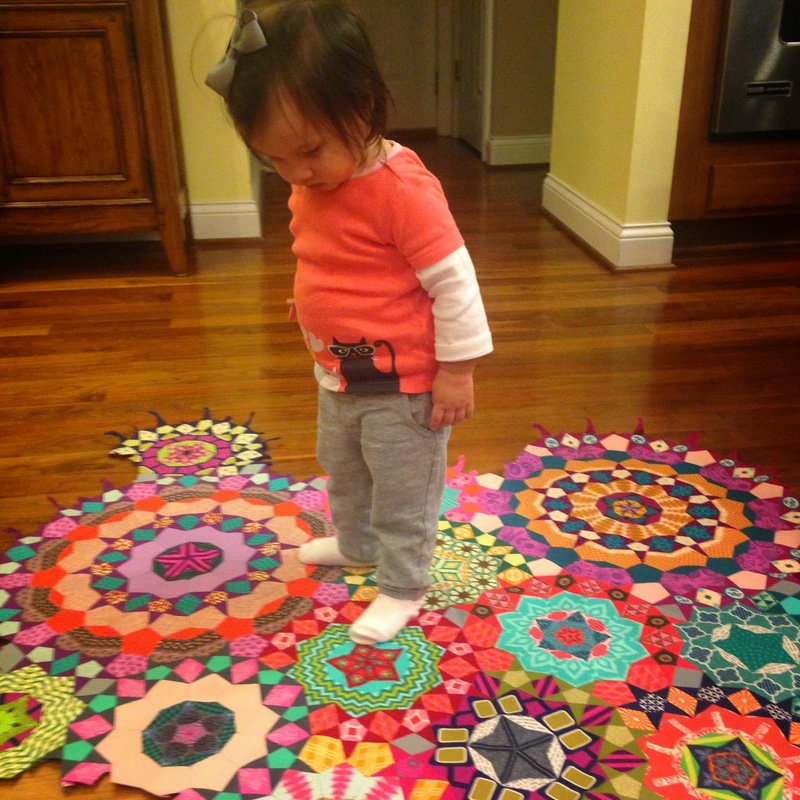 This rosette is complete and ready to add into the quilt. 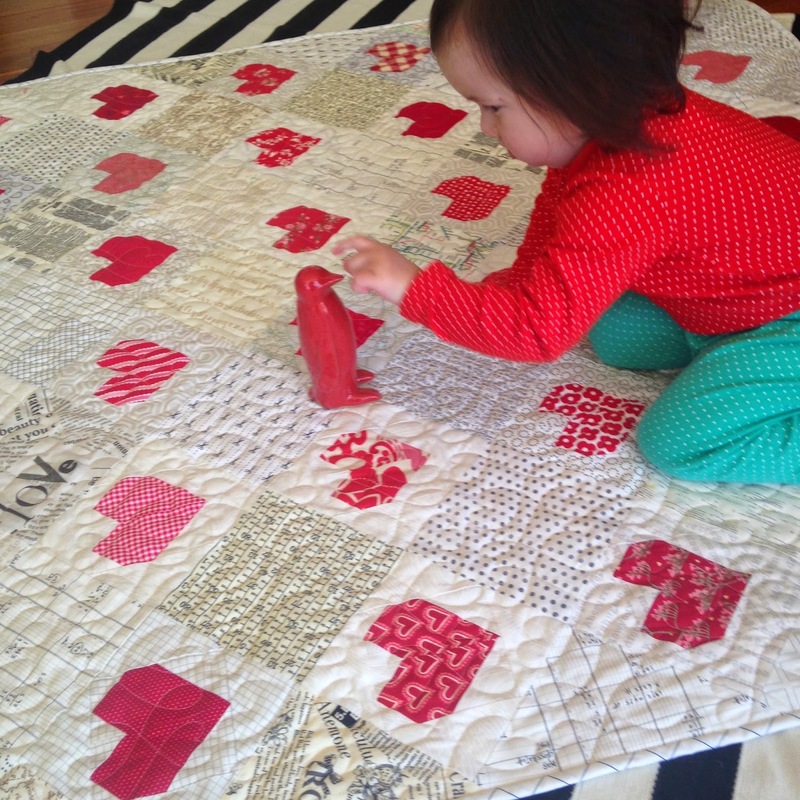 I then check the quilt schematic to make sure about placement. 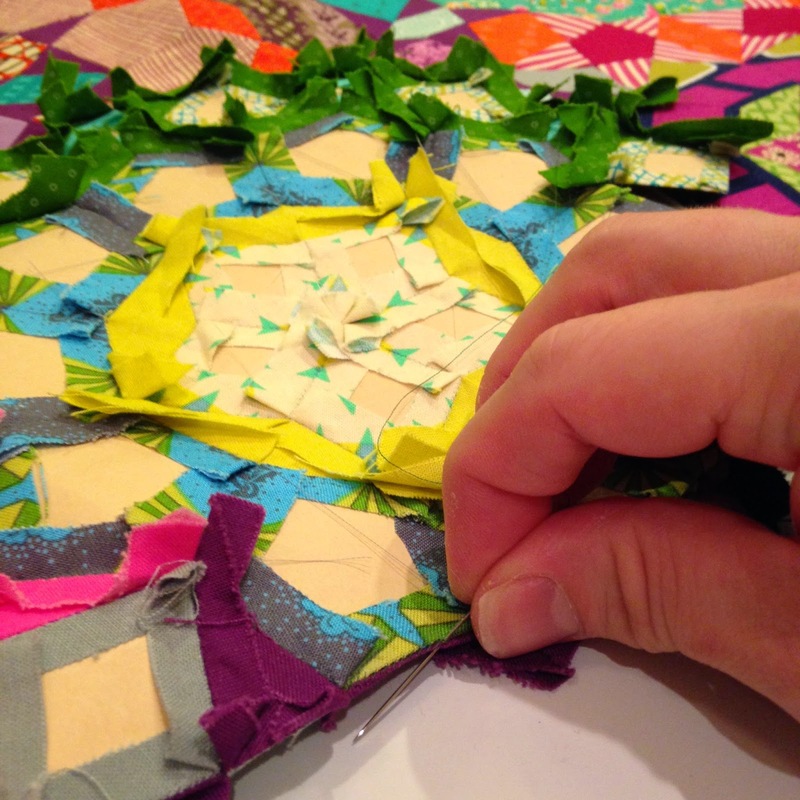 At this point, my quilt top is getting weighted from all the paper pieces that are still in place. I've only removed maybe 1/3 of them to date. I find that laying it out on my kitchen table helps to disperse the weight as I sew the cog into place. 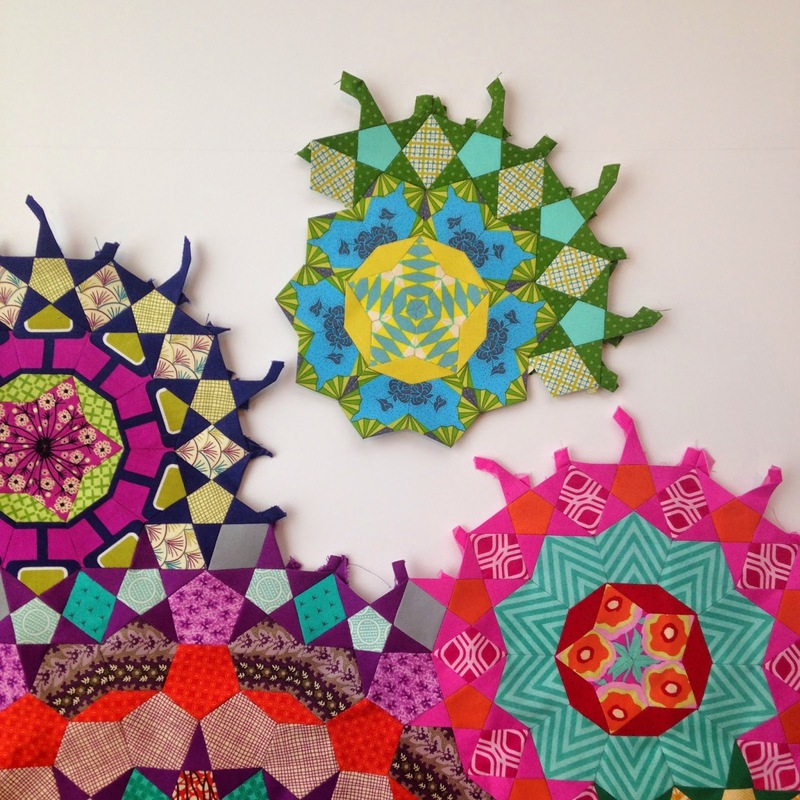 I thought it might be helpful to share the following with those planning or currently constructing this quilt. 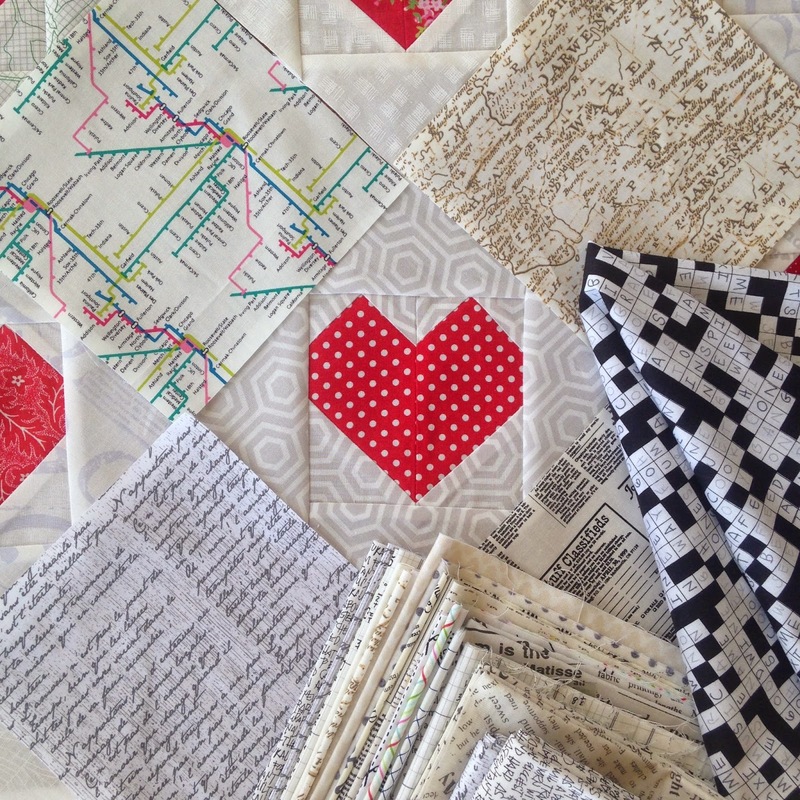 If you are working off of the complete quilt view found on page 164, it is correct. The areas circled in red are rosettes that don't quite match up to their prescribed numbers in the individual rosette instructions. 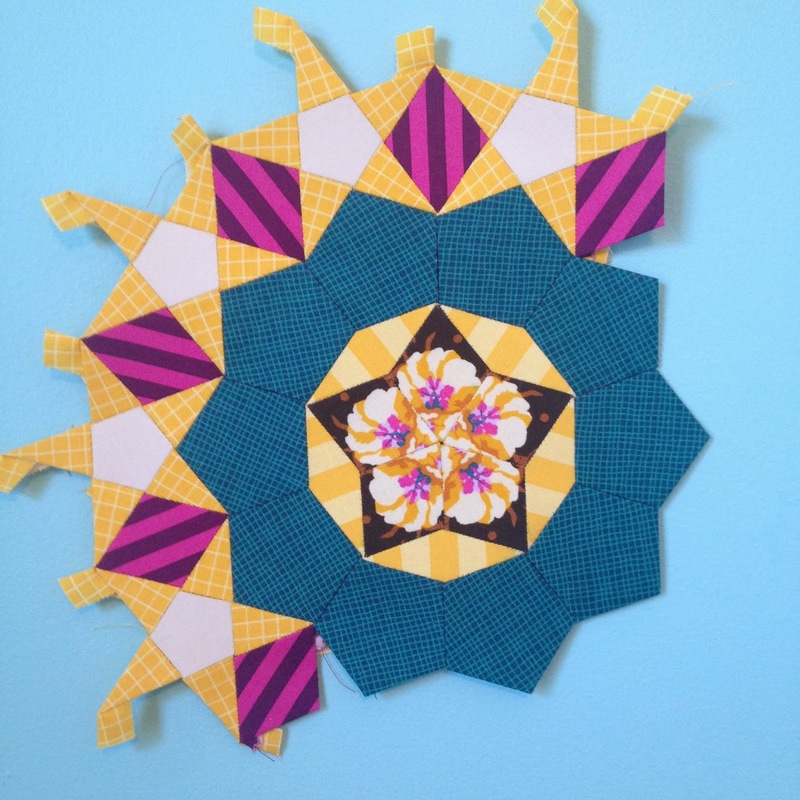 This rosette is labeled as a type 7 on the page 164 schematic, but it required an additional outer star and diamond to make it match the quilt overview. 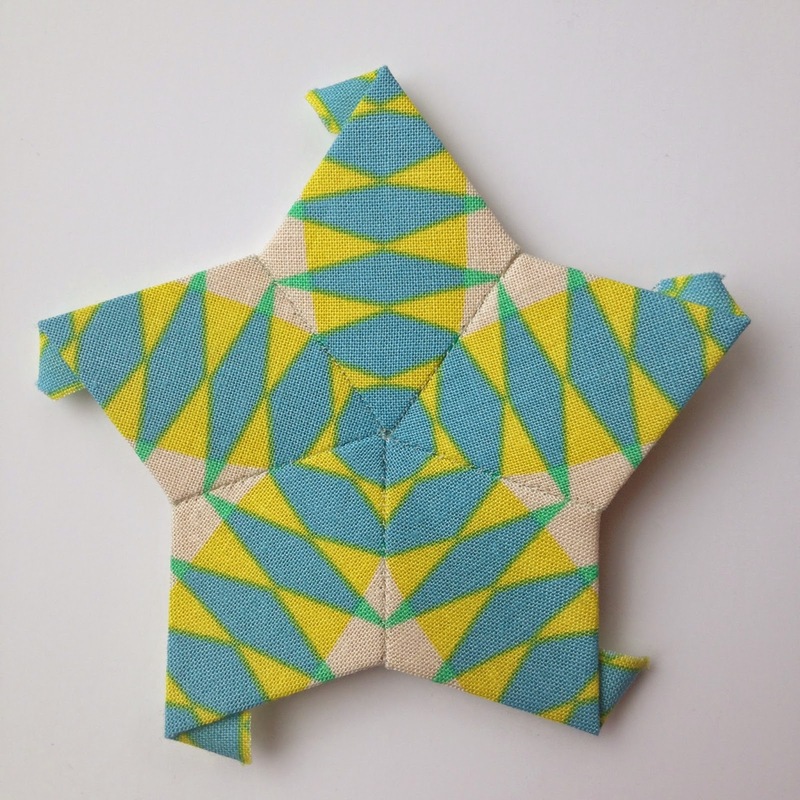 Type 7 rosettes on the individual instructions (p.162) require only 4 outer stars. 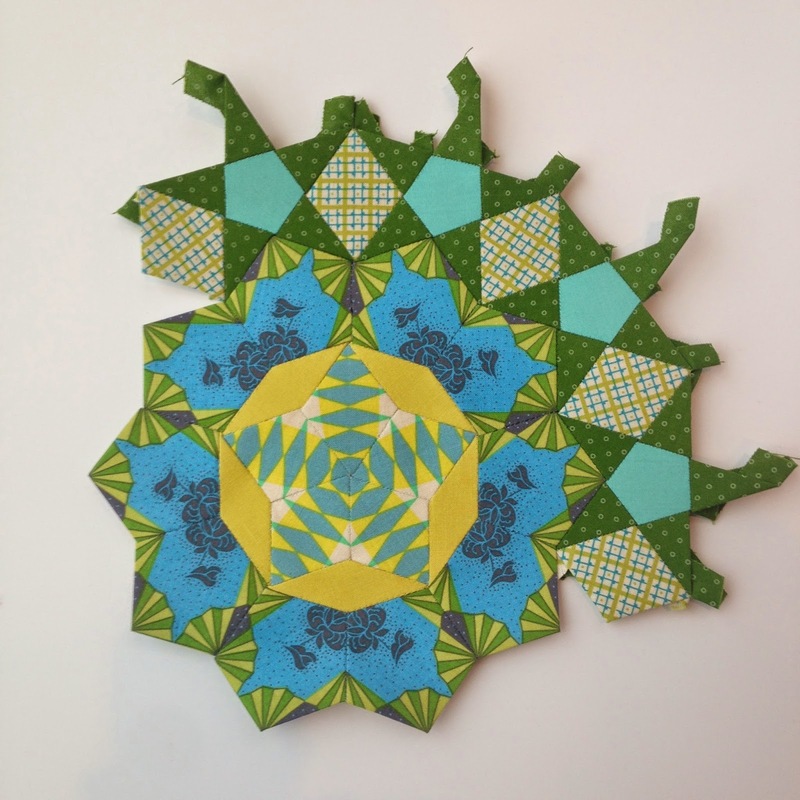 This particular rosette fits beneath rosette 1 on the quilt. This was an easy fix, because adding shapes to these is much easier than taking them off! The other area of concern is located directly beneath the large number 3 rosette. What is labeled as two number 4 rosettes is actually a hybrid combo. 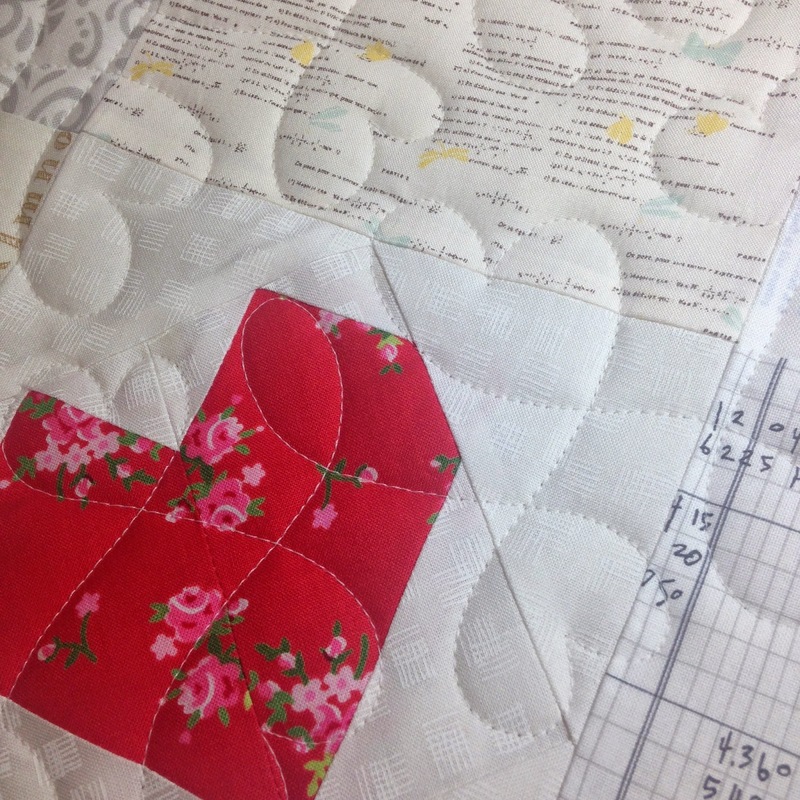 For this area, I just followed the complete quilt schematic (page 164) to help me choose the correct shapes and amounts of pieces to correctly lock it into place. 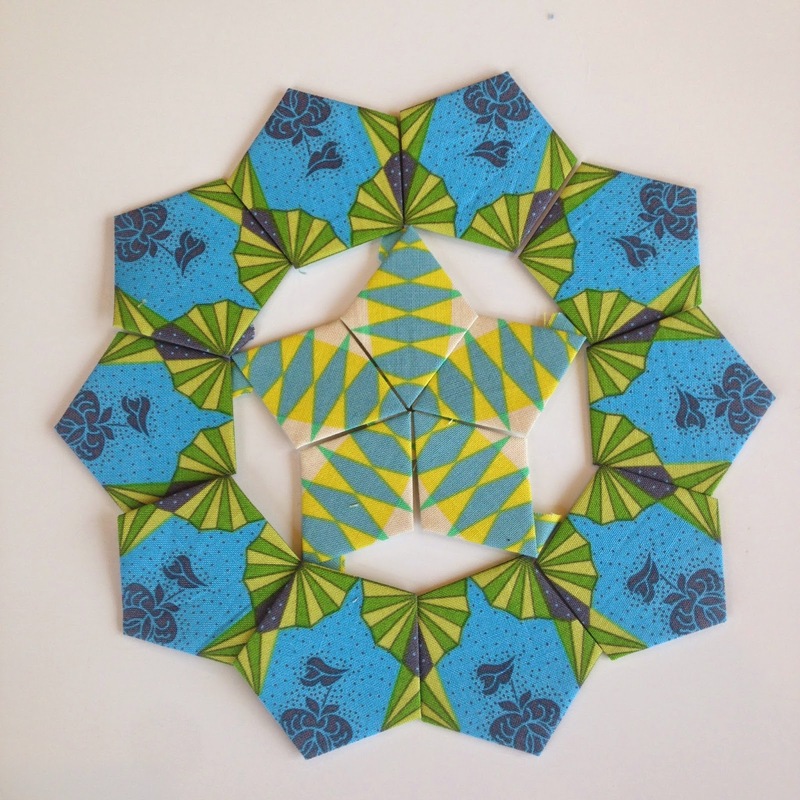 There are many, many pieces in this pattern, and it is completely understandable that a small change here or there might be necessary. 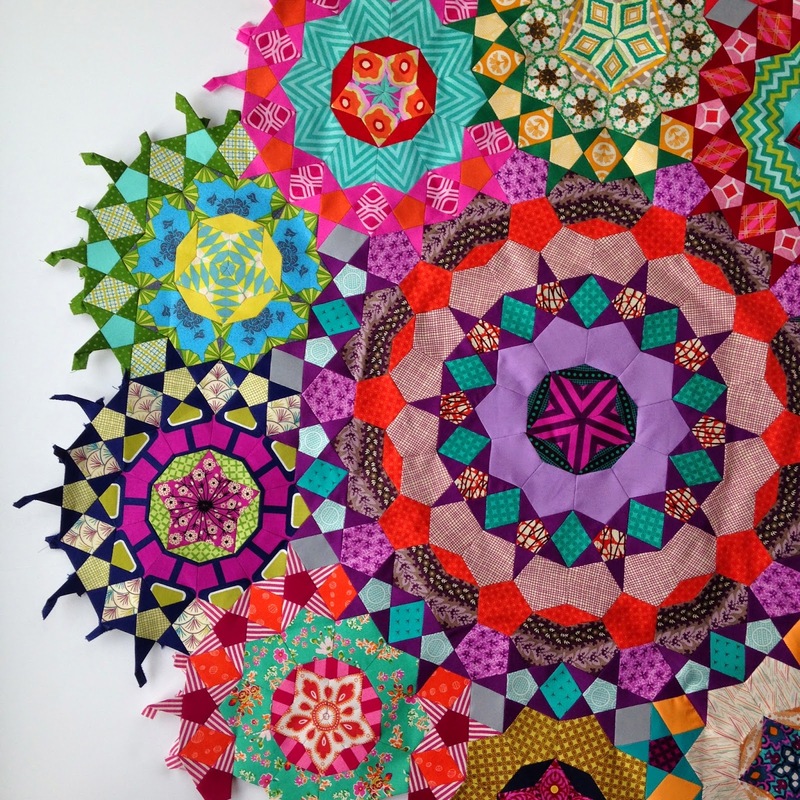 I mean in no way to disrespect the author or publisher of this amazing quilt. 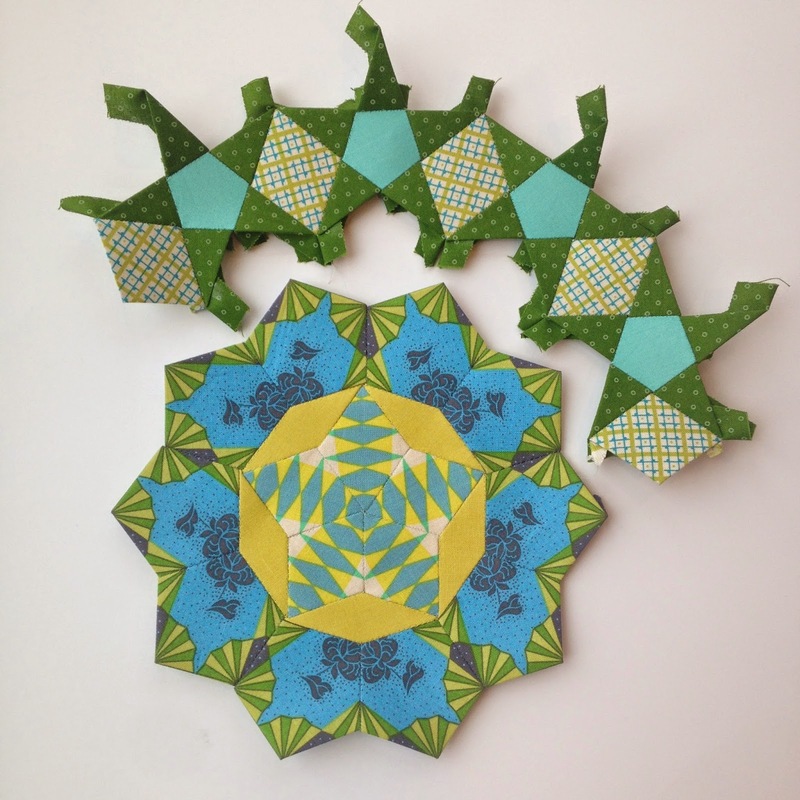 I would strongly suggest working off of the quilt overview diagram on page 164 to construct your laPassacaglia quilt. I switched to using it exclusively after these anomalies happened, and I have not had a problem since. It is accurate, and the best way to proceed, in my opinion. I'm sure those who are using it haven't experienced any difficulty, and are wondering what all the hullabaloo is about! 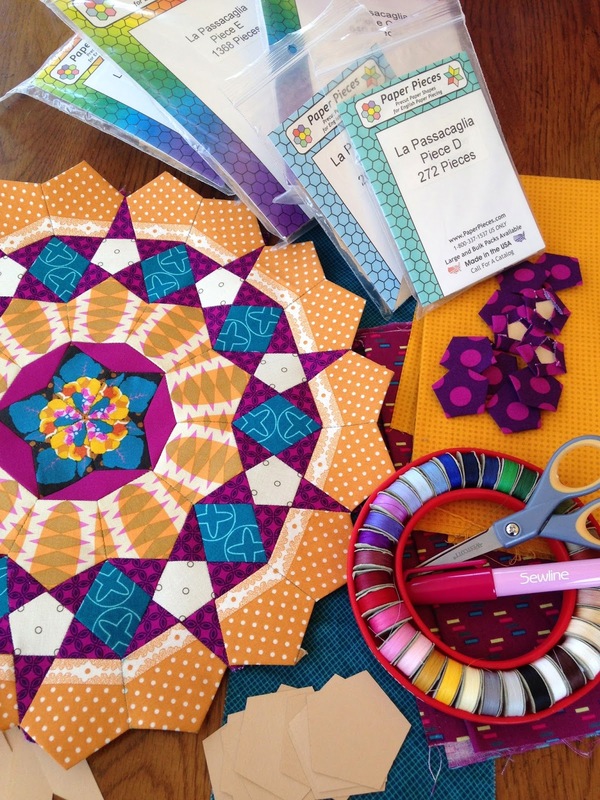 If you follow me on Instagram @kamiemurdock, you know I have this little addiction called the "la Passacaglia," an english paper-pieced quilt project from Willyne Hammerstein's book Millefiori Quilts, published by Quiltmania. Occasionally, I get a question or two about some of the supplies I use. -I purchased my paper stock templates from paperpieces.com. They are precision cut, and oh, so accurate. 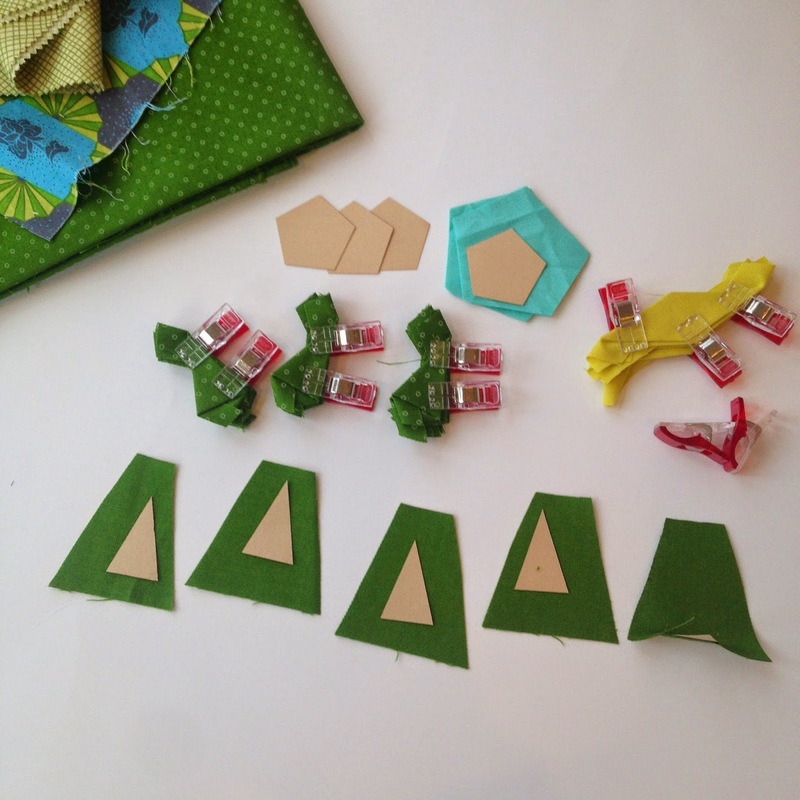 -Glue-basting is my preferred method of preparing my shapes, so I use a water-soluble glue pen (Sewline). 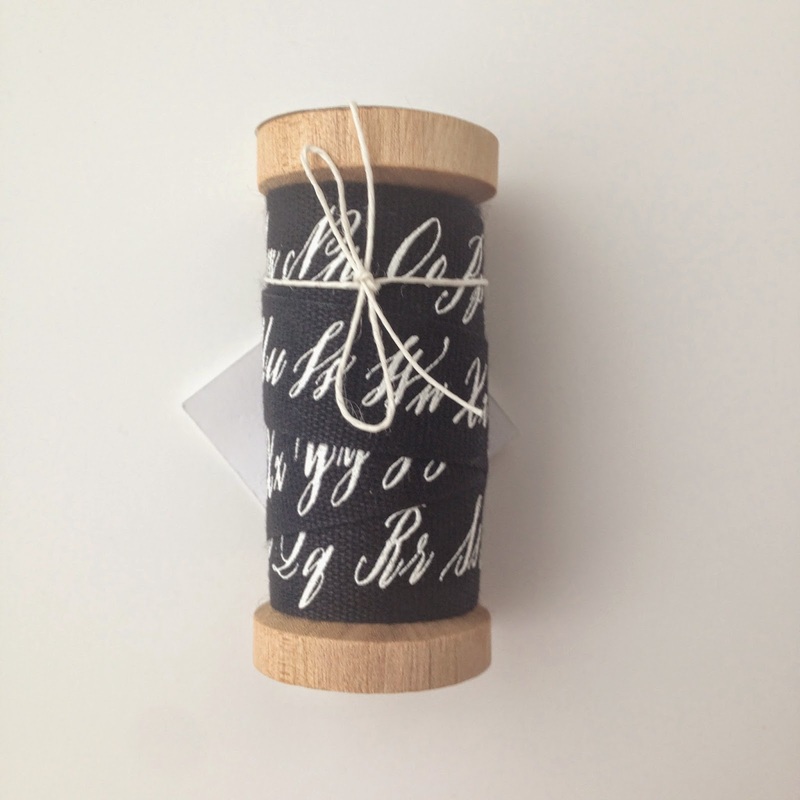 -My thread of choice is "Bottom Line," a 2-ply polyester by superiorthreads.com. They even have a ring available with an assortment of colors to aid the matching process. Light grey is also good at blending with multiple colors. This is the start of my first rosette, or cog. 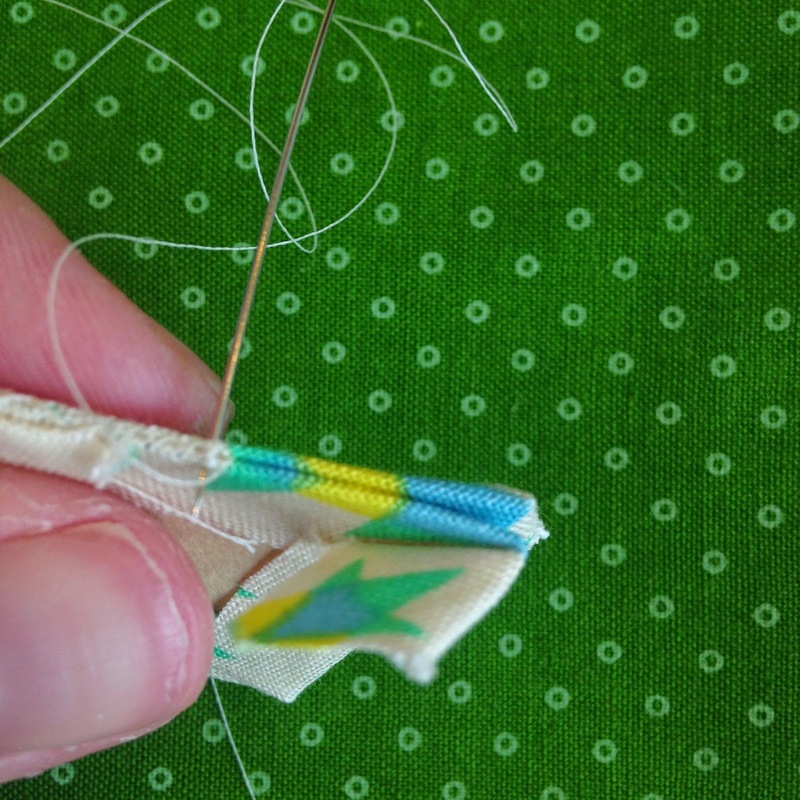 Some of my seams were cut a little too narrow (1/4"). I would recommend giving yourself more to work with, up to 3/8". Sooooo, I don't have a preferred needle to recommend at this time. (Several have been harmed in construction thus far). I have snapped multiple brands, sizes, etc. and I know its related to my technique. Usually when I start a project, I have a pretty clear idea of which way I'm headed. 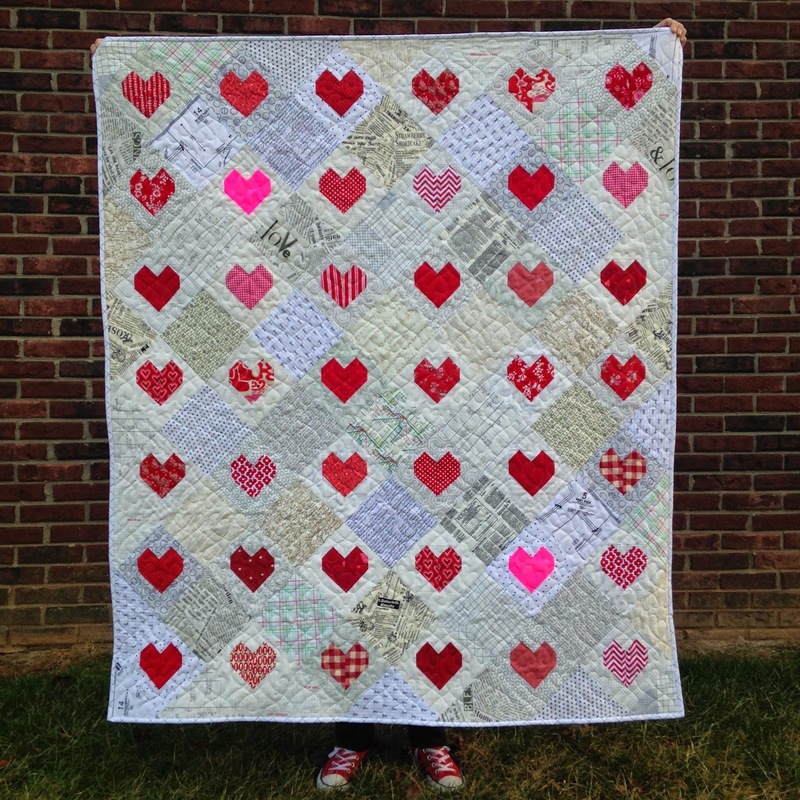 This quilt turned out entirely different from my initial concept, but I am in love with the end result! 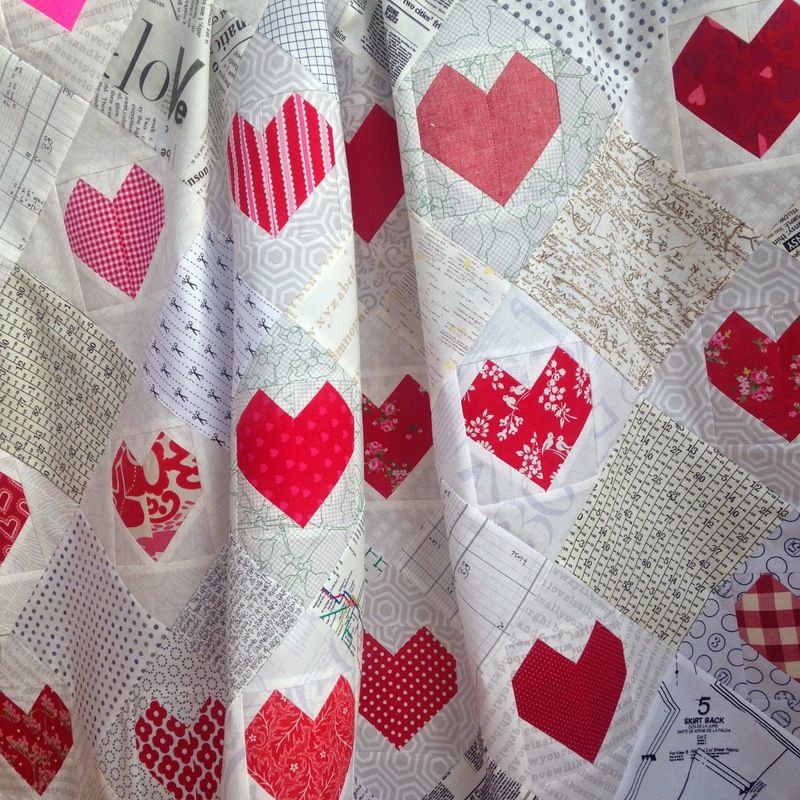 I used a heart block pattern that I had saved from a book that was headed to the recycle bin years ago. "My Heart Belongs to the '30s", designed by Sandy Bonsib, out of a Mimi Dietrich book. It finished at 6.25" after framing on point. I knew I wanted to use low volume backgrounds for the initial blocks, but I was going to use a contrasting color for the setting squares. BLUE. This shade reminded me of my worn & loved Raggedy Ann doll from my youth. 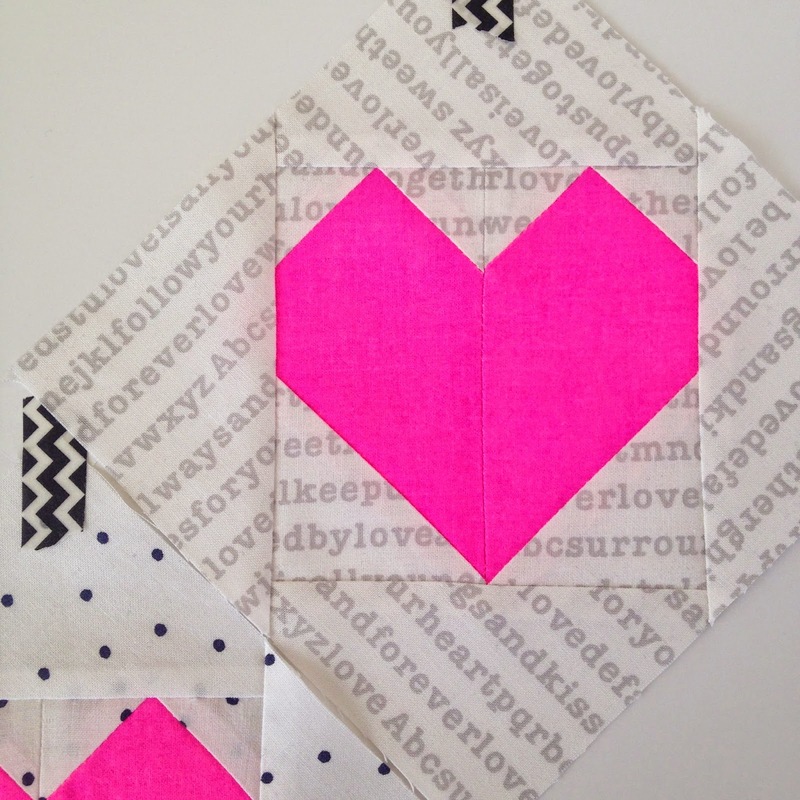 Perfect for a heart quilt, right? I felt the concept was golden, even making the drive to my LQS in Lexington to seek out a few more options. That should have been my first clue...after a HUGE stall, I realized I wasn't pleased with my choice. After considering purple, grey, and even orange(!) for possible setting squares, I had to accept that the blue wasn't going to happen. I have no photo evidence of those tryouts, and good thing, because some of the auditions were really bad. Awful, honestly! Low volumes to the rescue!!! I know why this craze is all the rage right now. Genius. When I laid these out together, this was the green light I needed. 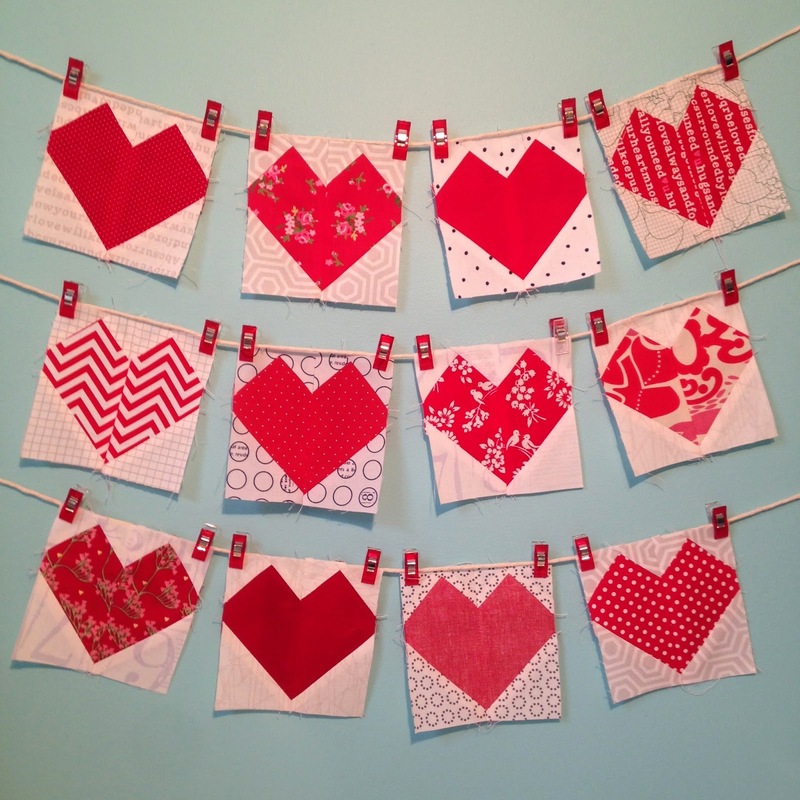 The hearts just seemed so much more light and airy- like they were floating on the background. And just like that- the top came together so quickly! 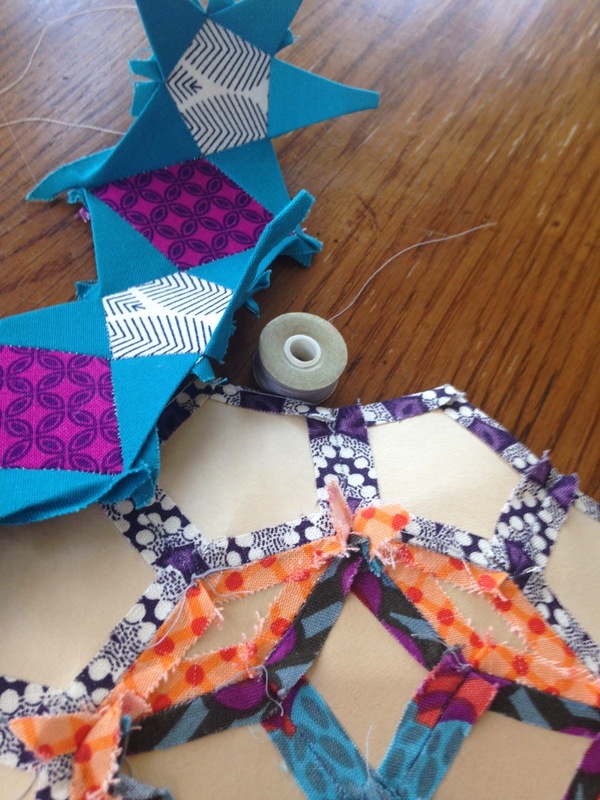 No custom quilting here. 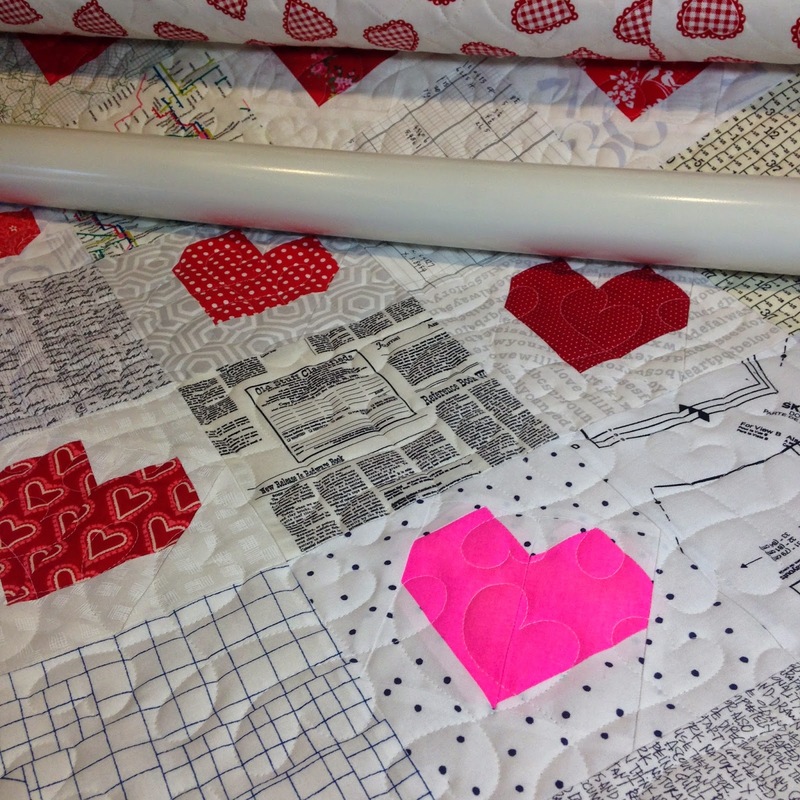 I chose a heart-themed pantograph from Digitech Designs, and got it quilted really fast. Love it. 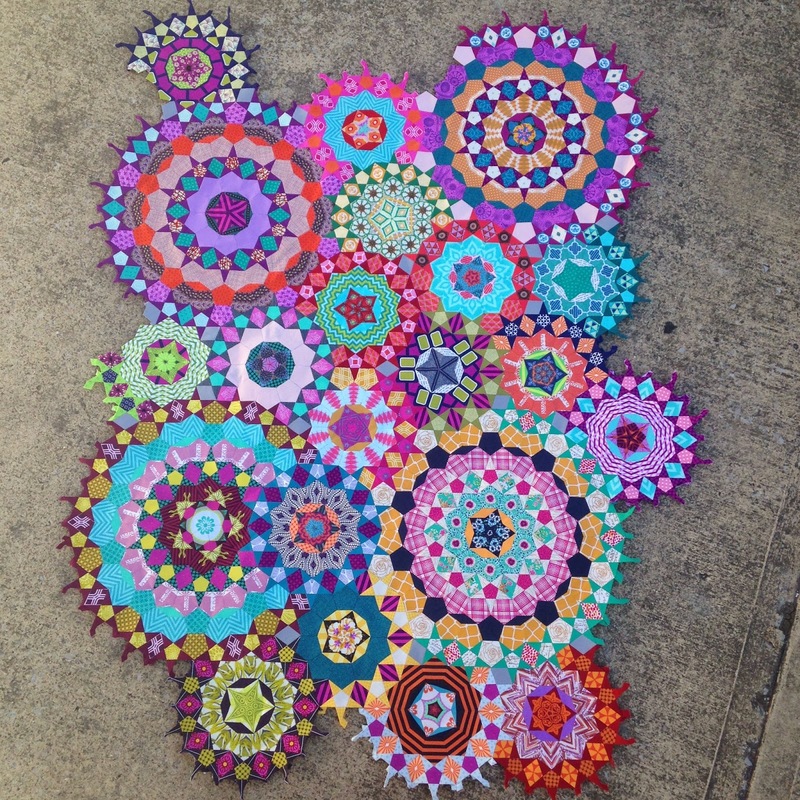 It finished about 50"x60", which is a little smaller than I would have liked. It's bound with 2.5" double fold. I kept the binding low volume also, (shocker) because I felt like this particular one didn't need "framing." The horse was already out of the barn on this adventure, anyway!